Kelly says: It will be clear to readers that this post was written by MyEmissionsExchange.com, but I want to emphasize that I was not compensated for it in anyway. Lots of people pitch stories and post ideas, many companies try to get me to talk about their products, but I’m very selective about who I mention. I found MyEmissionsExchange.com to be an intruiging idea- a great way to combine being green and being frugal. I liked the idea behind the company so much that, instead of having them advertise on the site, I asked if they’d be willing to write a guest post. As much as the “green revolution” is upon us, we’re not seeing much of an increase in consumer consciousness. To the average family, cutting energy use around the house may seem like a daunting and costly process. Solar panels are expensive, green products cost more than comparable products, and re-insulating one’s home may not be a step that the average consumer is ready to take. Put simply, there’s just not enough incentive to reduce household energy consumption. However, we know that incentives work. According to the Container Recycling Institute, states that implemented bottle return incentives experienced a 70-85% reduction in beverage container litter – even a 30-35% reduction in overall litter. To align economic and environmental interest, MyEmissionsExchange.com has captured this idea, and developed an incentive for home energy conservation. The idea behind My Emissions Exchange is to create a market for individuals to sell personal carbon credits, where you reduce your utility bill at home, and earn extra cash for it. 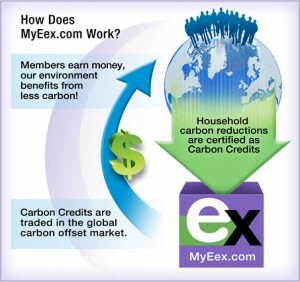 With MyEmissionsExchange.com, individual households and businesses can “earn green for going green” by demonstrating that they have reduced their electric, natural gas, propane, or fuel oil bill. The reductions are sold on the voluntary credit market, and retain value much like traditional offsets. The difference here is addressing the demand side of the equation – instead of planting a tree in the Amazon to offset the value, My Emissions Exchange motivates individuals to conserve. To get started, users sign up and input one recent utility bill (since most utility bills display a year’s worth of billing history). As users reduce their energy usage, the reductions are verified by MyEmissionsExchange and certified as “personal carbon credits.” These credits are then sold on the voluntary market to large companies looking to demonstrate their environmental commitment. There are various companies that choose this path – from IKEA to Timberland, from Dell to Yahoo. Finally, the profits from the sale are deposited directly into MyEmissionsExchange.com users’ PayPal accounts for the users to spend any way they like. The average household can save $400 a year on its utility bills and earn an additional $70 by selling the resulting personal carbon credits through MyEmissionsExchange. To those who are concerned about how to conserve around the home, MyEmissionsExchange.com offers no-hassle ways to immediately cut 10 percent off a user’s utility bills. As a recent Time Magazine article quoted, “by appealing to our checkbooks instead of our conscience, My Emissions Exchange might help reduce U.S. carbon emissions better than a stack of hectoring environmental reports.” In the current economy, with consumers looking to get the most out of every dollar, and companies looking to become more sustainable, MyEmissionsExchange provides a crossroads for conservation. The website mantra, “Be Green, Earn Green” says it all. What do you think about the prospect of earning cash for reducing your home energy use? what if I told you that in France, if you install solar panels up in your Alpine home: not only will the gov’t give you entitlement to a 50% tax credit, but also an interest free loan, potential eligibility to a grant, and the possibility of a modest tax free annual income for selling your excess solar generated electricity back to the EDF grid at â‚¬5/1?!?!? Well it’s true – go look here. And hurry up before they change their minds!! Thanks for the link! The problem is that this program, while not specifically only open to homeowners, is really conceived for people who own their own homes. What I like about MyEmissionsExchange is that you don’t have to install any equipment, nor own your own home to make it work. That said, if we owned our own house (not apartment, and not renting as we do now), I’d look into a combination of several different programs and ways to save energy use and money. Thanks for your comments. Just to clarify, MyEex works for anyone who is paying the meter, whether home or apartment, own or rent.